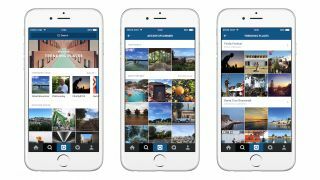 Instagram got a sizeable update today that overhauls its Explore page and introduces trending Tags and Places. The update looks like Instagram's move to position itself as the place to be for real-time events and moments (sorry, Twitter). Unlike the previous Explore page, which listed personalized posts based on things you've liked and users you follow, the new Explore page pulls up Trending Tags. The more targeted posts from the previous iteration of the Explore page will still be available to users below the new Trending Tags bar. There are also curated collections featured at the top of the page that will be updated twice a week, featuring collections like "towering rocks" and "extreme athletes" for users to explore. Seeing is better than reading? Instagram's search also got a power-boost with the option to search places, not just people and tags. Instagram has also added Top Search, which gives the option to search across people, tags and places together. "With more than 70 million photos and videos posted to Instagram every day, wherever something is happening, chances are you can see it here," Instagram wrote on its blog introducing the new features. But Instagram has a clear target in mind with the update. Seemingly taking a jab at the more text-heavy Twitter, Instagram added on its blog: "Rich visual content captures everyone's unique take - not just what the community is talking about, but also what they're doing and seeing." Instagram 7.0 can be downloaded starting today, and while the new Explore features are US-only for now, Instagram assures us it's working on introducing the new features globally.